The BetOnSoft (Saucify) casinos have been noticed on the online gaming scene. Casinos that utilize the HD gaming technology have soared in rankings due to their rather unique game offer. Road House Reels likewise benefits from the association with the software of choice. But the HD quality games aren't the only attraction. The promotional deals also fill a certain void in the web casino world. The welcome bonus deal is quite impressive when contrasted with what is available elsewhere. One thousand dollars awaits the player in free bonuses. Fifty free spins are also a part of the deal. 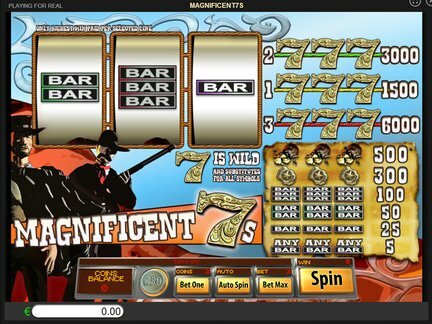 In fact, the casino has five welcome offers that can be claimed by the player. On the first deposit, the player can expect a 110 % match up to $250 dollars (code: RHWB1). On the second deposit, the user can claim a 75 % match up to $250 dollars (code: RHWB2). The Tales of New Video Slot comes with 50 free spins as part of the third welcome offer (code: RHWB3). On the third deposit, it is possible to claim a 50 % match up to $250 dollars (code: RHWB4). The fourth deposit allows the player to claim a 125 % match up to $250 dollars (code: RHWB5). It's fair to say that the promotional offers are rather impressive. All the financial transactions can be conducted in Euros, British Pounds, American Dollars and Canadian Dollars. The casino does not currently offer registration to players from the following countries; South Africa, Poland, Bangladesh, Romania and Australia (Australian players can only play the slots. Their table wagers will not be accepted). Since the casino gladly accepts US players, the traffic from that country is rather large. A statistically significant number of Canadian and British players have also been visiting the website in search for good deals. The Grand Prive Group Of Online Casinos are known for providing access to hot games. The Road House Reel is associated with the group. Therefore, the player is going to encounter games in multiple categories including; video slots, classic slots, video poker, roulette, blackjack and progressive jackpots. All the games feature the best graphics. They are a number of games that receive an unusually high amount of clicks from players. Here are a few of the traffic-drawing titles; Double Trouble Video Slot, Sweet Success Video Slot, Rise of Spartans Video Slot, Perfect Date Video Slot, Dream Wheel Progressive Jackpot and Break The Bank Classic Slot. The big winners across the Grand Prive network are featured on the group's website (see the "Recent Winners" section for details). Recently, the Roadhouse Reels Casino gave away 140,000 dollars in prizes during a single day. The list of winners features winnings of $60,000-$80,000 dollars. This is a very nice sum to win. The casino certainly does a good job with the jackpots. There's been some concerns about the affiliate program of the casino. However, the matter appears to have been settled. The casino players are not raising any fresh concerns. The casino has a fine reputation. The casino is licensed in the jurisdiction of Curacao. It has been established in 2001. There are numerous banking options on site; Credt Card/Debit Card/Visa/Neteller (Euro and GBP), Skrill and Moneybookers (Euro and GBP). 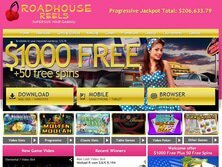 There are many positive features of the Roadhouse Reels Casino site. The acceptance of US players is one of those features. The other commendable feature is the gaming selection. It is increasingly hard to find a site that is able to provide good games across the game sections. It is simply enjoyable to play on the site. The high quality entertainment ensures that the casino will stay in relatively good ranking position in the near future.